It's just as important to consider Halloween safety for dogs as it is for the rest of the family. Get trick-or-treating tips on safe treats, doggie costumes, decorations, and more from dog expert Wendy Nan Rees. 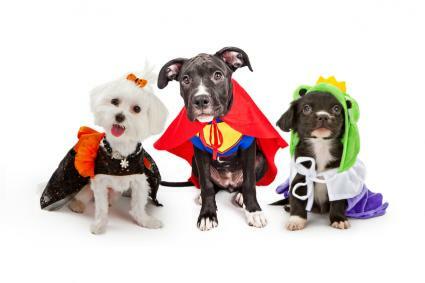 Halloween can be a fun holiday for all the members of your family, including your dog. Do you have any special plans for the night? Maybe you are going to a party, or perhaps you are hosting a party of your own. It's not a problem if you want to let your dog Boo participate in the festivities; you just have to take the same precautions for him that you would for your children. That's why this week I thought I'd give you some tips about Halloween safety for dogs. There are a number of food items that are either toxic or just plain hazardous to dogs. Raisins and chocolate happen to be two of these items that your dog could easily come in contact with this Halloween. Obviously, large quantities of sugar aren't good for your dog either, but this isn't your only concern. A pilfered piece of Taffy could get stuck in your dog's teeth, a jawbreaker could become lodged in his throat and block his airway, and the list goes on. Bottom line, try to keep all the kids' candy away from your pet. That said, there are many companies on the market that sell Halloween cookies for dogs, so you can buy your pet some healthy treats of his very own. You can even purchase cookies made with carob, which is a non-toxic ingredient that can be substituted for chocolate. If any of your friends take their dogs trick or treating with them, you might want to have a few treats like this on hand so furry friends don't feel left out. If you are having a party or decorating your house, make sure the decorations are hung well out of your dog's reach. You can never be too cautious about potentially toxic materials these days. Decorations can also pose a choking or tangling hazard, so be sure to remove any loose strings or parts that dangle within your dog's reach. Be especially careful about the kind of party theme tablecloth you use, and remove any hanging embellishments that might be tempting to your pet. Many people dress up their dogs for Halloween. In fact, Halloween has now become one of the primary holidays that people celebrate with their pets. You can easily purchase a doggie costume at your local pet store or online. They even make special dyes that you can use to color your pet's coat for the occasion. When buying a costume for your dog, make sure it fits snugly without being too tight or too loose. If you can, take the dog with you to try on the costume. This will save you the time needed to return it if it doesn't fit comfortably. Also keep chewing hazards in mind as you make your selection. If your dog is the patient type, by all means, go with a full length costume that stretches from your dog's collar line to the tip of his tail. However, some dogs are antsy about wearing clothing and will only tolerate wearing a half costume or head piece. My friend Ruthie has several sets of bat wings that her dogs wear for Halloween. There are armholes for the two front legs and the wings are centered over the dog's shoulder blades. If the costume comes with a mask, make sure the eye holes are large enough for your dog to see through. If they aren't, you can enlarge them with a pair of scissors as long as you make sure not to leave any sharp edges. You'll also need to make sure that the bottom of the costume offers enough clearance for your dog to be able to relieve himself with it on. In fact, it might be a good idea to exercise your dog before putting on his costume. This will cut down on chances for an accident. All in all, if you follow these tips, Halloween can be a safe, fun-filled holiday for the entire family, including your canine companions.